There are a gazillion great things about the new Windows Live updates that are just pure social love. I have the ability (if interested) to pull in Twitter feeds or blog feeds for all my social network to share and review. All the various services SkyDrive, Hotmail, Spaces, etc used to feel like different companies cobbled together. Now they really feel like one cohesive Live offering. Just seeing Twitter feeds from various members of my network arrive in my Home page is really sweet. The one critique I have is the lack of integration with Windows Live and my Mobile phone. I do not use the Calendar on my mobile phone because it is completely disconnected from the rest of my online world unless I dock my phone at the PC. 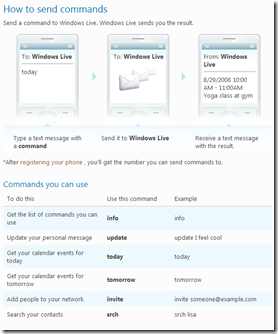 In order to bridge that gap Live provides a set of rudimentary SMS commands, as shown on the left. This is really disappointing! I was hoping for something more integrated and reflective of the new found symbiosis that is the Live experience. - My contacts sync from mobile to web and back again. - Live Messenger on my mobile phone is an enjoyable and easy to use experience. 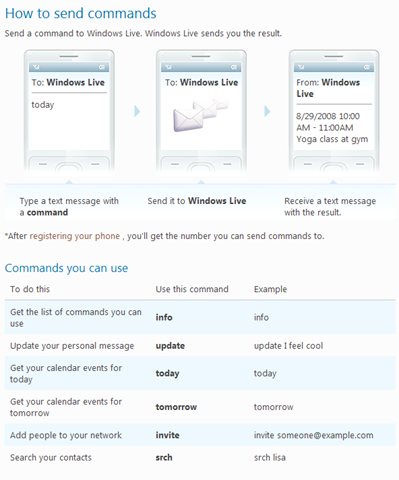 - Hotmail is directly integrated into the mobile experience. With the abundance of these great Live features the mobile experience still feels like a second class citizen in the Live world. If we have to wait for WM 7 for this to be resolved I will be really disappointed.